I love asparagus and tomatoes together, and lately I've been liking the flavor of thyme. I put all of those things together tonight in this pasta dish. Bring a pot of water to a boil; add asparagus, remove from water after 90 seconds or so. Cook pasta in this water. While pasta is cooking, heat olive oil in a large pan. Add asparagus, tomatoes, salt, pepper, and thyme. Saute for a few minutes until tomatoes are slightly tender. Add cream, bring to a simmer. Once the pasta has finished cooking, add it to the sauce and toss. 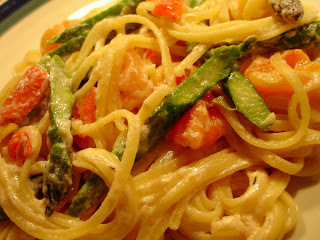 This pasta was very flavorful and extremely easy. The total cooking time, including prep, was about 25 minutes. this looks wonderful! this looks like something everyone in my family would actually eat. although my husband would probably be left with a plate full of tomato chunks. i will have to try this! Kayte - my husband was left with a plate of tomato chunks! But that's the good thing with cooking them this way, they can pick around them!